Royal Caribbean's highly experienced, full-service wedding service is called Royal Weddings. Ceremonies on this family-friendly cruise line can be performed onboard or in a port of call and need to be reserved and paid for before sailing. Royal Caribbean can also orchestrate vow renewal and proposal/engagement experiences. Royal Caribbean offers passengers two wedding packages: a modest and intimate ceremony and a more elaborate one that accommodates up to 100 guests. It's also possible to customize this entire event for up to 150 guests. Call or email. Royal Wedding Consultants are available Monday through Friday 9:00 a.m. to 7:00 p.m. EST. In the USA, call 1-888-933-7225. Or email royalcelebrations@rccl.com. Ceremony enhancements, which can include upgraded photography package, live entertainment, flowers, videography, hair styling and makeup application, spa services, even a rental bridal gown or tuxedo, are available for an additional cost. Charges for wedding and vow renewal ceremonies do not include marriage license fees or port-specific sales tax. To avoid paying a late fee, arrange your wedding at least thirty days prior to the cruise sailing date. Wedding parties may have a maximum of 75 non-sailing guests board the ship for their celebration. Most ships do not have a dedicated wedding chapel. Fortunately, there are event rooms that can be decorated, restaurants reserved, and out-of-this-world locations (like the North Star on newer ships). The line offers five wedding cake modern designs. Couples can choose the cake flavor (amaretto, carrot, chocolate, coconut, vanilla chiffon or velvet) as well as the filling (dulce de leche, honey coffee mascarpone, cheesecake frosting, lemon cream cheese, pineapple rum custard or raspberry). You can book a Royal Caribbean cruise by calling 866-562-7625 or going to the cruise line website or using one of the popular booking websites such as Travelocity or Expedia. Travel agents are also happy to steer a couple to a cruise vacation and some may be able to negotiate a better price, stateroom upgrade, or other trip sweetener. 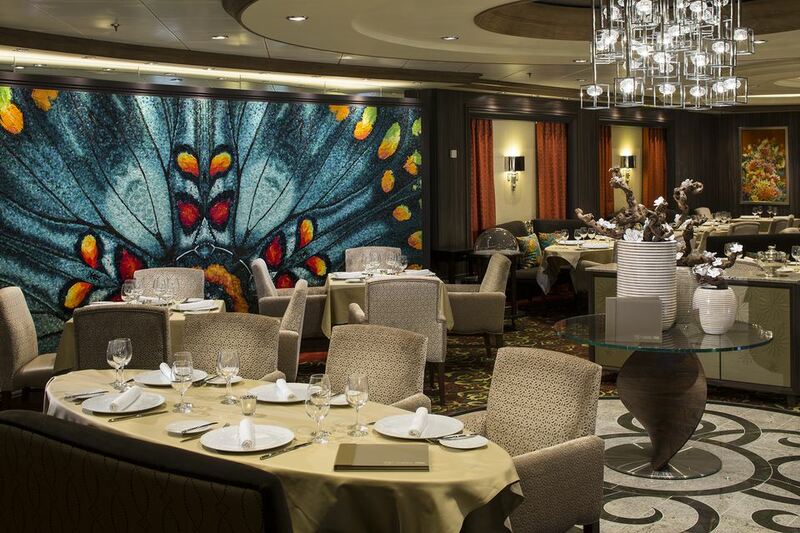 To make your sailing especially romantic, book a dinner table for two at one of your ship's specialty restaurants before you depart. Worried that something might go wrong during your wedding or on the honeymoon cruise? Royal Caribbean offers a Travel Protection Package that allows you to cancel your trip for any reason. It also reimburses medical costs incurred while cruising and emergency transport — although it's unlikely you'll need that.